Haines Towing has been family owned and operated for over 80 years. The business dates back to 1933 when Joseph R. Haines, Sr. and his brothers, opened a garage and towing service in Bordentown, NJ. Mr. Haines served in the Army Air Corp during World War II and after his return to the States, opened the current location, with his wife Pearl, in 1946. It has been in continuous operation at this location ever since. Haines Towing is deep rooted in its community and surrounding highways. Even assisting the contractors with various issues during the initial construction of the New Jersey Turnpike in the late 40’s, early 50’s. Currently Joseph R. Haines, Jr. and his wife, Christine run the company along with their daughter, Angie and son, Dale. At Haines Towing we think of our employees as family. We all work together to make sure our customers get the type of experience they deserve. We try to make an unwelcome and stressful situation, such as an accident or breakdown, as pleasant as possible. Over the years we have served thousands of customers to their satisfaction. We plan to continue this service, helping people like you and your family, with your towing, recovery and transport needs, for generations to come. Haines Towing primarily serves Central and South Jersey and Eastern Pennsylvania, all of the major interstates, including I-95, I-195, I-295, the New Jersey Turnpike and the surrounding municipalities. We also provide our services to the State of New Jersey and the State Police, through a contractual agreement. 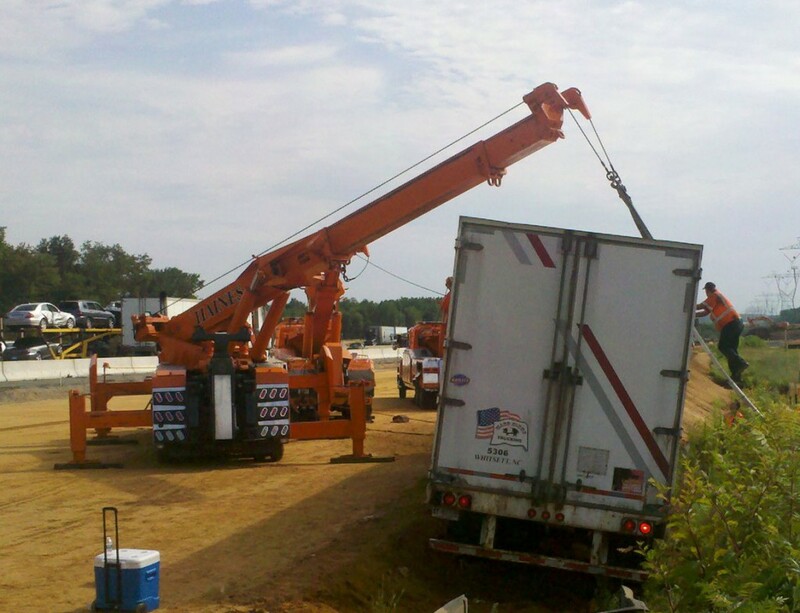 Our Specialty is Extra Heavy Duty Recovery. To help make Haines Towing the fast and convenient choice, we have Commercial Charge Accounts available. If you are out of our area…. We can provide another Towing and Recovery Operator through our referral service. We would be happy to quote you a price for any service. Just let us know how we can assist you with your project by using the contact information below. © 2014 Haines Towing All rights reserved.